Errr, am I allowed to enter on January the 1st? I really don't have time now, but was meaning to enter this anyway. I'll echo @KJMartin - I'm not sure if I've missed the deadline but I'll give it a shot if you'll still have me. As a thief hellbent on proving his worth, Io set about plundering a treasure from the gods. There are many such treasures, but most remain veiled behind the stars of Nyx themselves, unreachable by mere men. 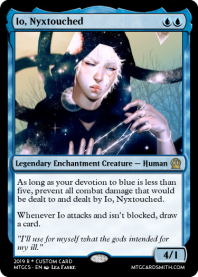 Through guile and deception, Io crossed the threshold of Nyx and swiped a draft from the fabled Chalice of Herodias, rumored to grant immortality. The legend proved true and Io found himself imbued with eternal life. But, as with all mythical boons, there was a price to pay - Io couldn't fully return to the realm of mortals. He was bound to the celestial energy of the stars. Thus, while he could yet walk the realms below, he couldn't physically influence the world around him. When the gods discovered Io in his plight, they resolved to leave him with his own consequences as a practical captive and as an example to other would-be thieves. As time passed, Io vigorously sought freedom from his incorporeal form. His unique nature and impassive charisma garnered some number of followers. Disillusioned worshippers from temples devoted their practices to overcoming Io's limitation and, with effort, were able to cause him to manifest physically for limited durations. Emboldened by the possibility of escape, Io has begun setting the stage for his grand heist - the "one last job" - to steal the Chalice of Herodias and finally escape from his starry isolation. The time to enter has been extended until the end of the day thursday, then we will have no "choice" other than to begin. So guys if youve got anything made, just drop it in. this will be your character for the run of the contest. A bio would be nice but its not required, just if you got time. Sorry for the late start guys. @KJMartin @dechujoh64, @murkletins if your still interested, nows the time to enter. I'm interested. I'll have a card made by today, then write the bio today. Peter nicknamed Smiles for his ability to bring life to even the most deprived. Has entered the fold of the Saga looking for a chance to revive the lost sparks of others. A noble, yet unfathomable task for anyone surely. Yet he refuses to give up. Peter was born and raised in the machine shops of the ruined city lands. He would've died if it weren't for the intervention of a fellow mechanic who designed him a new arm and closed the wound. Where is this once bustling city, we'll never know because Smiles has left on a plight to revive those with weening hope. The now named Smiles, has been searching the cosmos in his handcrafted aircraft and interspacial travel device for lost souls to revive their sparks. On his quest he has saved many lives, and inspired many more to join the fray. At this time, Smiles was pulled into an unknown situation one day to be known as the Saga. This section of space is vastly unknown and brimming with opportunities for Smiles to brim. After realise their gnomic constructs were nothing like the real ones, dwarves forced gnomes to work underground for centuries. The Great Elder Dwarf King Motgramli Longtoe did his best to hide and deny real gnomes existence and convinced other races it was always just gnomic constructs. Gnomes were enslaved, abused and tortured for centuries, but they were underestimated too. Bit by bit they started organizing until the day they plotted to escape. The brain behind this act was no other than Hisji, who was gifted and somehow higher the average gnomic intelligence. 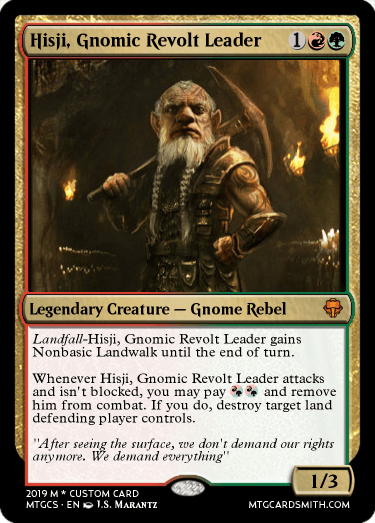 After they succeed on breaking out, Hisji felt such a massive anger that he swear to take vengeance on Dwarves and the rest of surface inhabitants who refused to help them. Can we enter more than one character? How do you delete a post? I don't want to confuse anyone with my multiple entries. I truly want Aldren to be a part of the story rather than Dahv'ar, but I do not know how to delete the post about Dahv'ar. @Revan for now just one character please. It can be any type and any rarity, it all depends on you. Tomorrow i am busy but ill try to swing in on here and see how the entries are coming. You guys have had ample time to drop something, ill accept new or old alike because youll have to create cards for this challenge in order to advance. Good luck to you all, and thank you for your patience if you've been waiting! Today is the last day I will accept entries. Please get your entries in if you haven't already. Thanks guys!! Alexine was originally from a plane called Golaku. For the first 14 years of her life she studied telepathy and other mind magics. Her intellectual superiority and photographic memory helped her studies. At the age of 16 after her training was completed, her hometown fell under the rule of a tyrannical priest that forced religion upon people and had anyone associated with magic burned at the stake. With this law in place she went into hiding and found a group had formed to hide and keep people away from the ruler. After a couple months, Alexine got tired of waiting and snuck out and staged an attack on the castle. 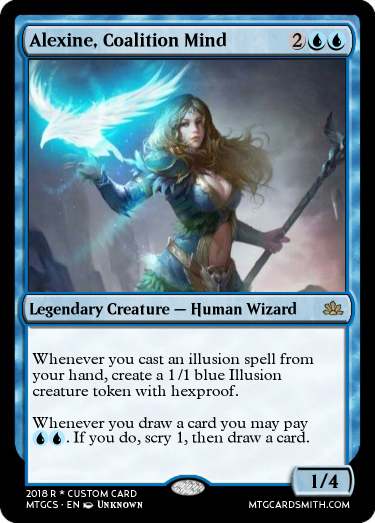 She was able to use her magic to sneak past the guards and get to the High Priest. The plan was working out until she got into his room, knowing that it might happen, the Priest set up a magic detecting field. Guards were alerted and Alexine was captured. The next day she was sentenced to death and put on a stake ready to be burned. As the flames rose higher and higher, Alexine formed a plan. After the flames obscured the view of her, she used her magic to try and summon some sort of illusion to help her out of the situation. After many failed attempts she started to lose hope. She could feel herself being burnt and eventually she gave into the flames. After she gave in, she started to wake up, but she wasn't really waking up. It was as if her spirit had left her body and gone somewhere else. In her spiritual form she could feel everything around her in a new sense. She could feel life everywhere around her, it was something unlike what she knew from Golaku, she was in a completely new place. After she continued to explore she started getting a feeling pulling her to something. After searching for that pulling feeling, she found something, or, someone. It was a girl, she was lying lifeless on the ground. As she drew nearer to the girl, she started to feel their energies combine. After letting the energies merge, she was inside of the body. She was in control, and it was physical, she was able to move a body again. 2 Days later she came across a fight between two forces. She looked into the mind of people and found out what was happening, there was an uprising on a dictator. After understanding what was happening she disguised herself as a mage for the rebels and helped their fight. After the battle, she started making friends and blending in. After a while she had a spot in the coalition and was never suspected of anything. She continued training herself and helping the fight and has been like that ever since in her new body. Even with this new life, she would never forget her old one. May i join in his place? I remember that card from Modnation's account. Good to see it being put into use! 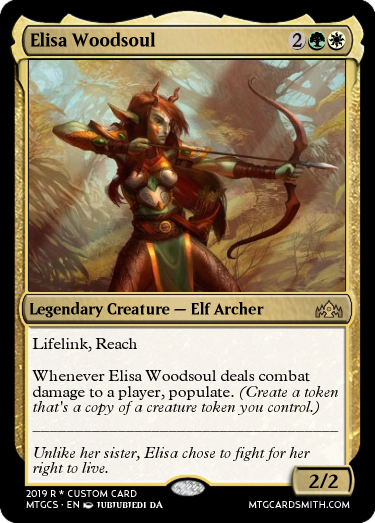 Elisa Woodsoul is the sister of Alura Woodsoul, split from a young age and forced into the wilderness by her family and sister as she showed traits of her ancestors, the horns on her head, which deemed her an outcast. Fighting for everything she has ever owned the as harnessed the skills of her sister and has manipulated her power beyond that of her sister, Alura. Her soul is possibly even linked to Vitu-Ghazi itself. when does this start again? I will be getting this contest up and running either tomorrow or on monday. There have been some things going on in the real world that concerned Aryanf and i that we needed to take care of. So as soon as i have the time to settle in, i will get this contest up and running. Meanwhile, anyone else who wants to join or drop is free to, just post a comment here thanks! Ok today is the day the contest starts ladies and gentlemen!! Once you pick your number, you will read the scenario as soon as I get back to posting it here for you, it will be a scenario exclusively for you to fulfill. Some will simply be bonus numbers where you will get items to help you in the saga, others will hurt your path, while others will require you to create cards for them. all the numbers are randomized, so be careful in what you choose! Everytime I get back on here to check who has requested for a number, i will post for that number to the cardsmith requesting that number, and mark it off the list here. Alrighty then, if possible i'd like to start by taking number 19. The wheel of fate turns I see!! I will choose lucky number 7! Your task: Create a Legendary Equipment card that can work in some type of way to protect your creature. Your character you created is about to go on a journey that protection will be needed. The equipment can be made any way that you choose to create it. Your creature has obtained an item to help sneak a look at three numbers in private! When you specify you want to use this, it is good for one time use only, and will allow for you to see what 3 of the numbers are, but you are not to allow other members to know this knowledge! This ability is based on trust that you will keep this knowledge to yourself for personal advantage in the game! It can help you to obtain victory for your character, or help avoid bad numbers! Use this item wisely, when you wish to use this, post here when you would like to use it, and i will pm you the 3 numbers you request to see what they are. Your task: Create an artifact that can help scry AND draw cards. Your character, Ame, is about to go on a journey that scrying and drawing cards will give her the information that she will need to help her deal with the Oni and the Humans in her planes. If you would like to add more to her story as she returns to her planes for this adventure, please do so when you submit your card for this contest!